Pocher HK102 Lamborghini Aventador LP 700-4 – Matt Black 1/8 scale model car kit! Twelve cylinders, 700 hp and 2.9 seconds from 0 to 62 mph. The gear box of the Lamborghini Aventador changes gears faster than the driver can blink. 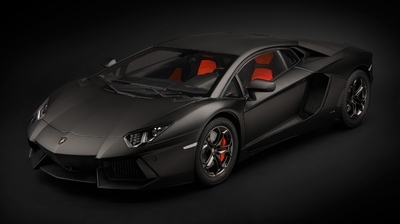 With a top speed of 217 mph and only 1,14 m high the Aventador is the equivalent of a jet fighter for the road. The engine is started by a “fire button” accessible after lifting a small red flap. Following an old Lamborghini tradition the name ‘Aventador’ goes back to a Spanish fighting bull, however Ferrari, Bugatti & Co. watch out, this ‘Toro’ does not just want to play! The US$400,000 car has a lightweight design and is the first large scale production Lamborghini featuring a monocoque made of carbon fibre reinforced plastic. Propulsion is provided by a longitudinally mounted V12 mid-engine. The power transmission is carried out by an Independent-Shift-Rod Gearbox. The driver can choose between automatic mode and manual mode using shift paddles.